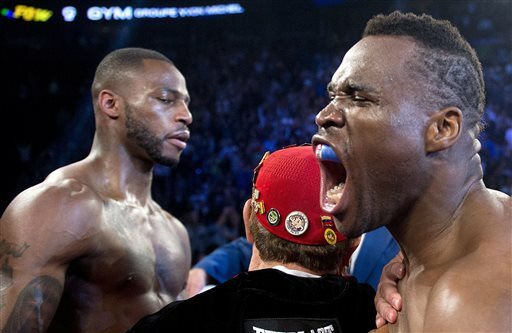 Chad Dawson lost his WBC light-heayweight title as Adonis Stevenson secured a knockout victory inside the opening round at the Bell Centre, Montreal. Dawson had come into the fight with scant regard for Stevenson’s capabilities inside the ring, however was quickly forced to reconsider his dismissive attitude as the 35-year-old Stevenson’s left hand secured an eighth consecutive knockout victory. The result- a third career defeat for Dawson- may leave Britain’s Tony Bellew in line for a first crack at Stevenson later this year. Elsewhere, Ola Afolabi saw his hopes of a cruiserweight world title evaporate as he was outpointed by Marco Huck in Germany. The pair, meeting for a third time, had been expected to serve up a combustible encounter, however the fight rarely touched the heights of their 2012 draw as Afolabi ceded a large lead on the scorecards, before narrowing the gap down the stretch. Huck retained his WBO title with a majority decision- one judge having the pair even 114-114 with two other scores of 115-113 and 117-111 going the way of the German.